As Bryan Miller Gallery's press release on Jamal Cyrus' DKONKR says, the show is "like an elaborately prepared puzzle with clues to the artist's intent spanning eras and epochs." Except for several parchment works in the back gallery, the pieces in the show are puzzle pieces that stand not only physically but compositionally apart. At first glance, no two are obviously alike or even related. Opposite the door, an oversized stencil of a plant leaf greets you. It's flanked by several potted plants from the plant species Ipomoea, John the Conqueror, from which the show derives its name and a whole lot of its mojo. Stepping into the main gallery, a large photograph of a dead dog printed on leather hangs to the left. The word "Birmingham" runs down its left side. I assumed the image is from the Birmingham freedom marches. In speaking with Cyrus, he revealed that the image is actually from Afghanistan, which in my mind immediately equated civil rights marchers and Afghan "freedom fighters". A few feet a way is what looks like a gelatinous blob covered in Cream O' Wheat. Closer inspection and a hint from the title and list of materials tells me it's a pig made of ballistic gel, which is used to discover/predict the "effect" of a ballistic projectile on a flesh-like object. It's also covered in grits. I get an odd sensation of breakfast, gunpowder, and the scientific approach of killing and maiming. This piece shoots into my brain the thought of a sheriff or a staff sergeant in a southern slang ordering me to eat up because we had a "big job" ahead of us and we'd need the strength. Arranged near the bullet piggy bank, is a grainy photographic image that is characteristic of the documentary footage of the 60s and 70s. The image is of a crowd. In the mind of an American, the facts and our historical prejudice equate the image to civil rights marchers or labor union strikers. However, the crowd is holding up shoes, which due to some political theater during the second Bush administration, we've learned is an insult in middle-eastern culture. Americans give the finger. Arabs give the whole shoe. Cyrus succeeds in making the foreign familiar so that this image of Egyptian protesters seems interchangeable with a picture of the march on Washington or the Triangle Shirtwaist Factory fire protest. 37" x 37" x 28"
Beyond the bright orange FA/TA/HA, beams a blue rectangle. The rectangle is a fuzzy picture of a room with numbered markers on every item in it. I can barely identify the contents and I can't seem to find a legend for the various numbers. However, I know this trope. I've been to enough natural science museums and history museums to recognize the archeological trappings. Cyrus revealed that the image is a FBI photograph taken after a raid on the Black Panther's headquarters. In his treatment of the photograph, he's raised it from photographic evidence to historic relic. Thus, the Black Panthers share an historical experience with Tutankhamen (first desecration and then much later adulation). 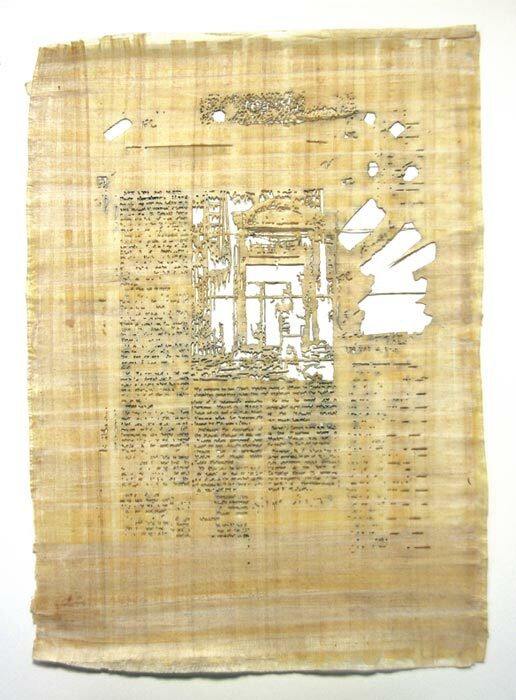 In the back gallery are a series of documents that have been laser printed on to papyrus. The documents are unreadable but you can make out letters and words from the Latin alphabet. 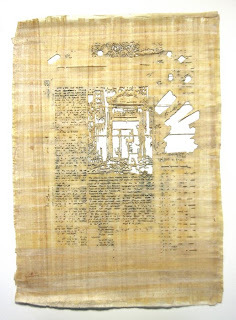 Large swaths of papyrus are cut away, some in geometric blocks, some in gestural swipes. Their sources are redacted documents from FBI files on the Black Panthers. Yet they could easily be an FBI document on Martin Luther King Jr. or Earth First or Green Peace. The abstract nature of the pieces blur, mix, conflate, and confuse. They are exercises in the study of negative space as a censorship tool. You don't know what is being hidden from you. You just know that something is. What these puzzles successfully do if you take the time to work them, is both conflate and transcend history. They match the not so distant past struggles for human rights (under the auspices of civil rights) with the immediate present struggle for human rights in the Arab Spring. 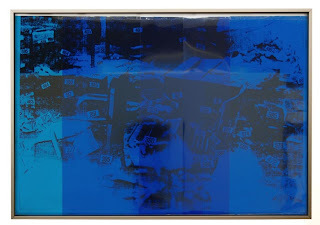 Through Cyrus' purposeful and playful decontextualizing of his chosen subjects, each piece dares us to search our own memories (personal or media-fabricated...I was an unfertilized egg/lonely sperm during the civil rights era) in an attempt to place the image in a socio-historic context. In doing so, we get it wrong. We mistake movements, mix up ethnicities, misplace entire decades...which seems to be the desired effect. Cyrus studiously removes enough of the context to force us toward abstraction and generalization. Are the protesters in Egypt's Tahir Square or in Yemen "militant anarchists" or "terrorists" who threaten the fabric of civilized society? In the eyes of an established kleptocracy, which stands to lose control and currency if power shifts, hell yes. But only in the same way that the demands of the civil rights movement, the feminist movement, the Black Panthers, the Chicano movement, Native American movement were "acts of anarchy" because granting them human rights would threaten the stability of a society that profited from denying them dignity. The mojo of the show is Jamal's handling of these images. The puzzle and its momentary disorientation is the "sugar" that gets the audience to swallow the medicine. He creates a moment where a viewer whose profited (either consciously or unconsciously) from the oppressions of others might cheer the Arab Spring only to realize that the oppressed whose rights he so passionately defended are not just over there but also right here. (Looked at any state budgets lately?) Robert Mankoff's cartoon published in the New Yorker February 28, 2011 issue sums up the conundrum quite succinctly. "I'm thrilled that the aspirations of the oppressed might be fulfilled over there but very concerned that it might spread to over here." Walk the maze and work the puzzle of the show if you dare to confront DKONKR. The only thing missing may be a mirror.